At Telligen, we believe Community is so integral to transforming the health of populations, that it’s one of our corporate values. That’s why we introduced Volunteer Time Off (VTO) as a benefit in 2018. Since introducing this benefit, our employee-owners have been hard at work demonstrating our core value of Community and making a difference in the communities in which we live, work, and play. 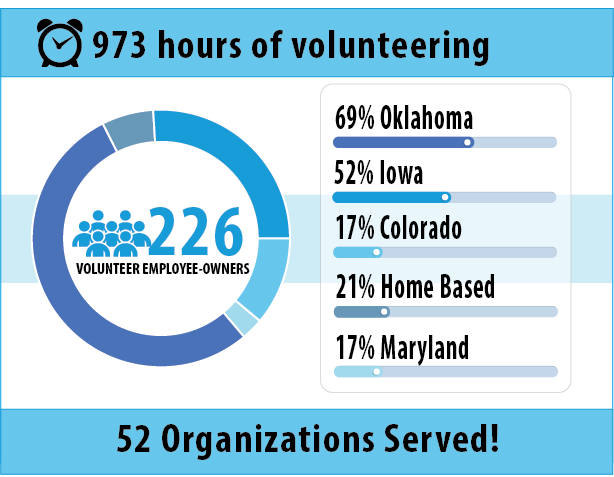 Our employee-owners have contributed a total of 973 hours of volunteer time so far in 2018! Click here to view information on our VTO utilization through the third quarter.